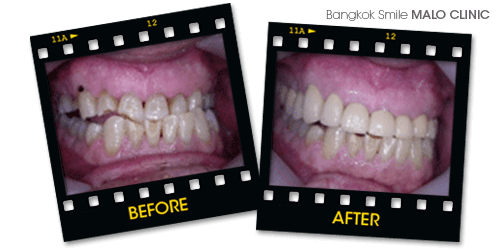 Smile Makeover in Bangkok by Bangkok Smile Dental in Thailand. A smile makeover, or sometimes called a mouth rejuvenation, is the individual recreation of each tooth in the mouth. A smile makeover is necessary when the teeth are worn down, broken, missing, or if you experience pain in the jaw joint, headaches, back pain, muscle tenderness, or clicking/popping of the jaw. One should consider the procedure because such symptoms will likely lead to problems in both the bite and appearance of the mouth. A smile makeover utilizes a variety of modern technology to reshape and rebuild one’s teeth, gums and surrounding areas. One or several procedures may be necessary to obtain the desired effects. The end result is an enhanced appearance will allow you to enjoy the confidence and attractiveness you truly deserve. A smile makeover also corrects imperfections in bite position and enhances the appearance of your smile. Anyone with short, worn teeth or those that are chipped and broken throughout the mouth would be an excellent candidate. Combining the science of Neuromuscular Dentistry with the artistry of Cosmetic Dentistry, a smile makeover creates a smile that is functional, comfortable, and beautiful. Neuromuscular Dentistry measures and determines the optimal position of the jaw. Once determined, the jaw position is corrected with the use of an orthodontic device (a virtually invisible appliance that fits over the top of the lower teeth, gently repositioning the jaw) or the application of dental restorations, including porcelain veneers, dental crowns, or inlays/onlays. As an added benefit, the restorations are exceptionally attractive and strong, thus making your beautiful new smile a long lasting one. Using advanced technology and equipment in our clinic, we will measure your jaw's muscle function, both in a stressed and relaxed position. If an imbalance is determined, we will decide whether to treat with dental restorations and/or other procedures which would suit your specific condition. We will use beautiful porcelain restorations, dental crowns, dental veneers, or onlays that can raise or lower the bite to achieve the most comfortable jaw position. With this correction, you will immediately experience a decrease in, if not eliminate, the pain and discomfort you are feeling. Moreover, you will start to achieve better overall health and function. I have pain in my teeth that seems to move around. I have facial, neck, shoulder and/or back pain. The gentleman in the photos below had a constellation of dental problems and issues. His bite had changed over the years as it does with most people as they age. Over the years his bite gets worn down, which makes his teeth shorter and in turn, makes his entire face shorter. His lips lost the support from the teeth and so his entire face gets impacted from years of wear and grinding. The makeover/reconstruction process was done with customized ceramic porcelain crowns and precision porcelain veneers. As can be seen in this dramatic photo, the patient regained form, function, and most certainly, an aesthetic effect that is dazzling and will endure for years to come. This major porcelain reconstructive makeover had a dramatic impact on his life... not only did he acquire a great smile to boost his confidence, he also gained a better lip support and a correct bite as well.